With its ultra durable construction and ergonomic design, Jurni allows you to sit down for a rest break anywhere you want, and a pop-out pod lets you quickly access to your essentials. Cool? Let’s go on for the suitable carry-on luggage. 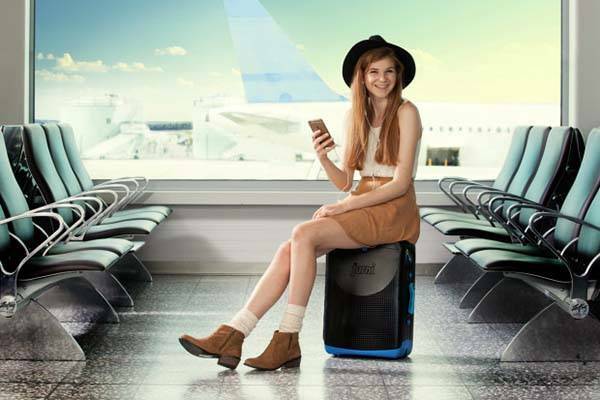 The Jurni is an innovative and functional carry-on suitcase that measures 20″ x 14″ x 8″ and weights 7.3 lbs. As we can see from the images, the luggage shows off a sleek and simple design, and colored accents add stylish feeling to the luggage. Meanwhile, the Jurni is constructed of impact resistant polypropylene plus its pelted design in order to take up 220lb (100kg) of sitting load. The carry-on suitcase has a 23ltr internal compartment and elastic bends on the hardshell cover to hold your numerous essentials, and a flexible shelf provides two modes including classic mode and cabinet mode, which help you reasonably arrange the large compartment. Moreover, the Jurni features a removable pod with splashproof seal. 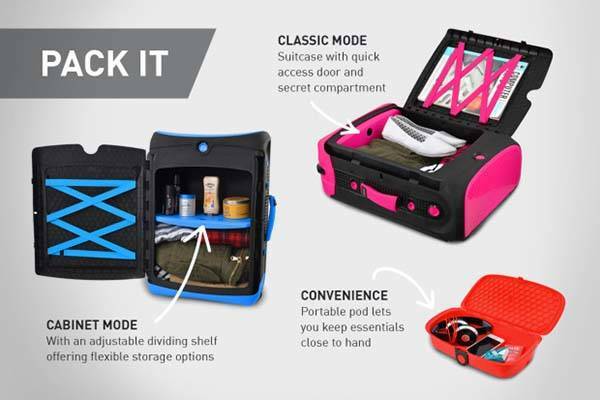 You can use it to store those frequently used items like iPhone, wallet and more for quick access, and the pod is removable, so you can also use it as an individual storage box. Furthermore, when it’s attached on the luggage, the Jurni delivers you a comfortable seat for a rest whether you’re, or you can also sit and glide your Jurni for a pretty fun way to move at the airports. 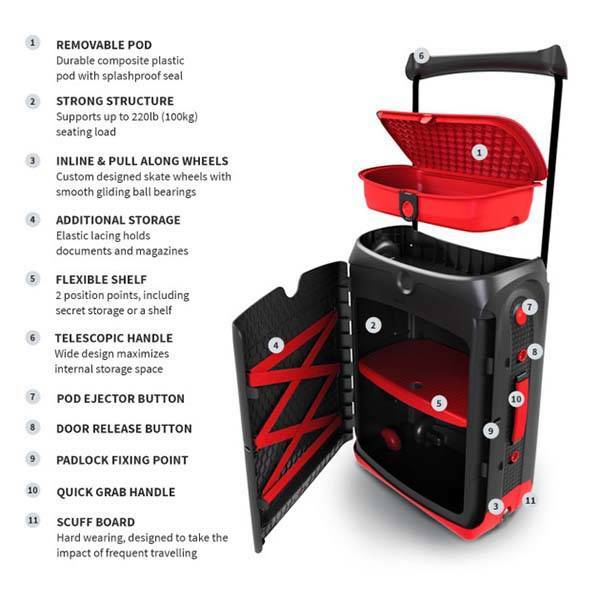 In addition, the luggage comes with two inline and pull along wheels with smooth gliding bearings, telescopic handle with wide design for maximizing internal storage space, and a quick grab handle. The Jurni has been available for preorder on Indiegogo. You can pledge $99 to preorder the sittable carry-on luggage. It will be shipped in February next year. BTW, also don’t miss G-RO carry-on luggage and more related cool stuff by following tags.